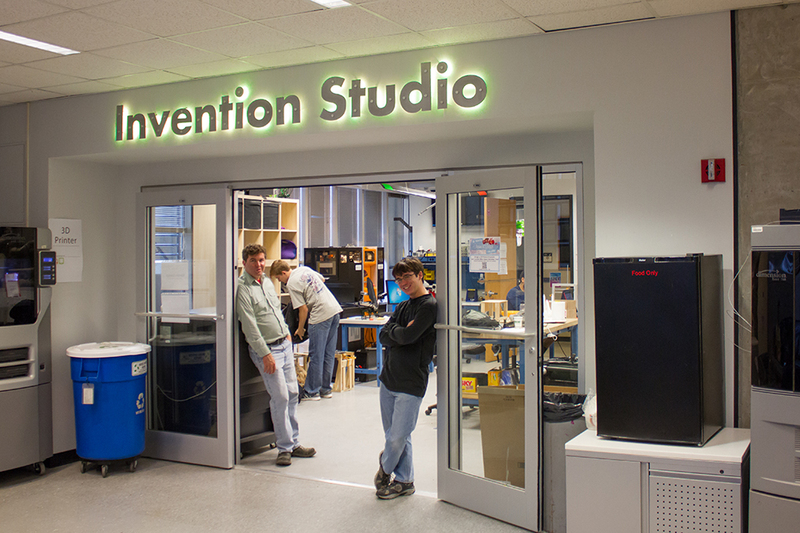 3-D printer cluster, woodworks, cutter room, machine shop, Electrolounge – these five rooms make up the Invention Studio, a design/build/play space located in the Manufacturing Related Disciplines Complex (MRDC) on the west side of campus. The studio acts as a hub of tools and information available to help channel users’ creative energies, with an emphasis on students taking the lead. “You have to give students a chance to let them succeed,” said Dr. Amit Jariwala, Director of Design and Innovation for the School of Mechanical Engineering. With the tools in the studio, users can work in a variety of disciplines, including engraving, woodworking and mechatronics. Students have to supply their own materials, but use of any of the devices is free, save for the high-end 3-D printers, unless students bring a “really cool” design. The studio is open to any student wanting to make a project of any sort – last month, many students set to work on Halloween costumes. Though the physical resources are certainly necessary, perhaps the greatest offering the studio has is its open, creative culture. University Lab Instructors, identifiable by their yellow armbands, are student volunteers always available to assist in equipment training and safety. The Lab Instructors are often Invention Studio enthusiasts themselves who give three hours a week of their time in exchange for the ability to access the space off regular hours. They’re led by Director of Operations Veronica Spencer, who also had her first experience in construction in the studio. Often, students first get involved in the studio through the Capstone Design course required for engineering majors or similar required projects. One such student is William Harwood, a fourth year ME, who first entered the studio to work on a course-required competition. He found that, in addition to the usefulness of the tools, he “really loved the culture” and went on to work on a quadcopter-mounted camera and a Sputnik-inspired cell phone holder. Others are immediately drawn to the studio. “When I visited Tech, the one thing that stood out to me was this place. I spent six or seven hours here, it’s one of the major reasons I came to Tech,” said first year ME, Himanshu Dedge. He explained that he often spends a large amount of time in the studio, even if he’s not working on anything himself because he’ll often be inspired by other people’s projects. Enthusiasm like this provided the nucleus that the studio formed around in 2009. The initial idea of having a space for hands-on application of the practice of engineering started the studio, and it grew organically from there, absorbing office spaces around it. The studio’s operation has proven to be a model for other universities and continues to be a haven for creative thinking and design.